Located on the ground floor of this popular Sukhumvit Nana hotel, Monsoon Café, considered one of the best restaurants Sukhumvit, covers all your dining needs – from early-morning breakfast and coffee, through to a late night snack and drinks. Stylishly decorated, and with a relaxed and easy-going ambience, Monsoon offers a wide range of menu items and drink specials throughout the day. Whether you choose to dine indoors or outside on the terrace, you’ll be sure to find something that takes your fancy. The menu includes a wide range of international dishes in addition to many local Thai favorites. For those who are longing for a taste of home while staying in their serviced apartment in Sukhumvit, there is also an array of café style fare and Western staples, such as burgers and pizzas. 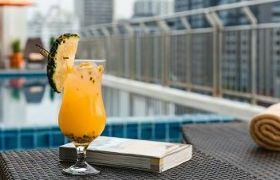 A wide selection of alcoholic and non-alcoholic drinks and light snacks are also available at the Cocktail Bar – perfect after a long day outside in the hustle, bustle and tropical heat of Bangkok.